Polk County, Florida — Detectives with the Polk County Sheriff’s Office are asking for help from the public with an Attempted Murder Investigation. At approximately 6 a.m., on Saturday, September 21, 2013, a shooting incident occurred in the area of Edwin Street, NE Winter Haven. 31-year-old Kelvin Lewis Key-Herrington of 518 Sears Avenue NE, Winter Haven, was identified as the shooter. The victim was transported to a local hospital to be treated for an injury to the hand. 66-year-old Deborah Mobley Thompson, Key-Herrington’s grandmother of 213 Avenue P NW, Winter Haven, approached a witness shortly after the incident and threatened the witness with violence if her grandson was identified as the shooter. 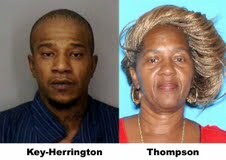 There are active warrants for the arrest of both Kelvin Key-Herrington and Deborah Thompson. Key-Harrington is facing charges of Attempted Murder, Shooting into an occupied Vehicle, Tampering with a Victim and Possession of a Firearm by a Convicted Felon. Thompson is facing charges of Tampering with a Witness. Both are considered to be armed and dangerous. A $3,000 reward is being offered for the capture of Kelvin Key-Herrington. Anyone with information in the whereabouts of Key-Herrington and Thompson is urged to contact Detective Jacob Alderman at 863-297-1100, or 863-298-6200.